Sports, Media and Tech conference hosted by @NYCMediaLab held @YahooNYC. Here is what I gathered about the current opportunities in the Sports Tech space. 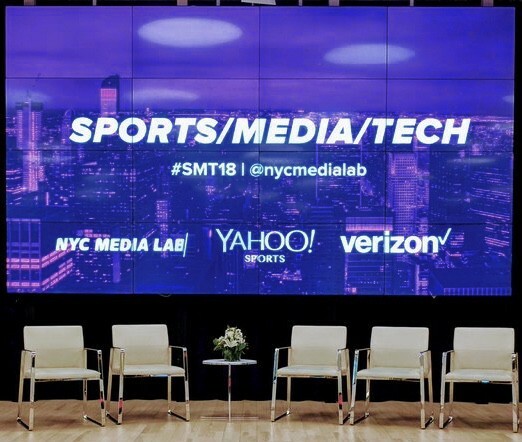 Arguably, the buzzword of the day at #SMT18 was ‘personalization.’ The success of the sports tech sector hinges on startups’ abilities to provide personalized content and more intimate solutions for sports fans. The number of fans who sit in front of their televisions and consume entire sports contests is dwindling; consumer preferences are shifting towards bite-sized content on the go (i.e. highlights, scores and injury updates); at this rate, we can expect a lack of demand for full sports contests in 10 years. Experts assert the notion that personalized content will incentivize sports fans to consume entire sports contests again, 30% of all customers in subscription-based business models say that they purchased the given product because of a personal connection to the offering. Personalization is critical for sports entertainment providers to not only grow their user count, but to have users consume content in its entirety as well. The eSports sub-sector has set the bar for personalization and the degree of intimacy between a fan and player needed for a fan to consume an entire contest. ESports fans have the ability to speak and strategize with their favorite players during contests, in turn allowing fans to feel as if they were apart of a close-knit team. Inevitably, fans will want to draw even closer to their favorite eSports figures and athletes alike. I expect this desire for intimacy to transcend eSports into traditional sports as well. The solid line between an athlete’s public and private life will soon become blurred to the point where there will no longer be a differentiation. In the near future athletes will have to embrace accessibility or they will no longer be relevant to sports fans. Can playing video games really be considered a sport? I was one of the many traditional sports enthusiasts that was skeptical about the legitimacy and longevity of eSports as a sub-sector. My reservations about the eSports space quickly disappeared after hearing Jason Xu (CEO @Battlefy) speak with a great deal of conviction about the industry. ESports is taking the world by storm in a relentless and unapologetic manner, an example of which was seen when Xu shot fellow panelist Scott Kaufman Ross (Fantasy & Gaming VP @NBA) a snarky grin while explaining how eSports engagement reached 200 million unique users monthly in just five years compared to the 50 years that it took the NBA to reach the same feat. Their exchange exemplified an eSports victory over the many naysayers and skeptics around the world, this sub-sector could potentially command the majority of the venture capital invested in sports tech in the future. Numbers don’t lie; the eSports explosion is highlighted by the 1,125 percent increase in venture funding from $11.96M across six deals in 2013, to $146.49M across 34 deals in 2017. Deal flow was roughly the same from 2016 to 2017, however there was an 186% increase in total capital invested which shows that VCs are becoming more confident in the space. I expect both deal flow and invested capital figures in eSports to increase as markets continue to leverage blockchain technology and experiment with cryptocurrencies for the fragmented eSports betting space. Did you know that colleges in the U.S. are now offering scholarships to the top grade-school eSports prospects? As a former NCAA Division I athlete, the expanded focus is one I never would have expected. Many of my past teammates would have not gotten an opportunity to attend college without sports and now that eSports has become mainstream, it is increasing accessibility to an even larger audience that want to attend college but may have financial hardships or aren’t athletically gifted. In today’s startup ecosystem, it seems as though just about every industry is trying to leverage blockchain technology in some way; the sports industry is no different. Incorporating the blockchain in sports seems like a viable solution to collect consumer data in sports arenas. Panelists toyed around with the idea of an open ledger to track a sports ticket from “gate to gate.” Increasing the revenue generated from fans during live sports events would be ideal for sports organizations, and one way to do this is to monitor consumer behavior by tracking a blockchain ticket to better understand when a consumer is more likely to purchase food items and souvenirs or participate in promotional giveaways during sports contests. After collecting this data over time, sports venues will be able to leverage this data and adjust the fan experience in order to increase engagement and fan total spend. While there is no clear-cut blockchain ticket solution for sports on the market today, a few panelists were optimistic about potential offerings in the near future. Management: Matthew Savare (Founder & President); Andrew Gansler (CEO). Funding: Currently raising a seed round for the completion of their MVP, marketing and content distribution. My Thoughts: YouTube currently has 1.5 billion active monthly users consuming mobile content; along with increased social media influencers, this illustrates the shift in consumer preferences towards raw and personalized content. In terms of consumer demand, the timing is right for Fansmit. We are already experiencing alternative commentary in the market today, which creates a unique opportunity for social broadcasting solutions that can provide personalized commentary to digital natives. Looking through a VC’s lens, I would like to see how the Fansmit team plans to monetize the platform; I plan to keep an eye on this startup throughout the year as the team works to build a more complete product. Management: Milton Lee (Founder & CEO); Damien Delannay (CTO). Funding: $5.5 million in total funding across three rounds. Elysian Park Ventures led their Series A in 2017. My Thoughts: KeeMotion has great traction; they have deployed their cameras into 15 college arenas to date and have had a successful partnership with the NAIA during the league’s Men’s Basketball Championships in 2017. As the KeeMotion team continues to refine their technology, I expect the number of live-streamed contests to skyrocket as these advanced cameras would eliminate the cost of camera crews for sports broadcasting companies such as ESPN. I believe that KeeMotion has mass market potential, making it a strong prospect for acquisition in the foreseeable future. I was very impressed with the KeeMotion pitch and will continue to track this startup. Overview: PLAAY is a video production platform that automates the creation of sports highlight reels for players, scouts and fans. The comprehensive mobile application uses artificial intelligence to recognize players and compiles multiple highlight clips into a minute-long video in just a few easy steps. Funding: PLAAY raised a $1 million seed round in 2017; Meads Bay Capital led the round. My Thoughts: I believe that the timing is right for PLAAY. There is an inherent demand for highlight reels within all sports. The one minute videos that PLAAY creates fit well with the video time limits on the social media platforms where a great deal of videos are shared, i.e. Instagram and Snapchat. I remember spending tens of hours figuring out how to create my own highlight reel for professional basketball teams using iMovie because platforms such as PLAAY were not readily available during my senior year. I expect this product to be very popular with young high school and collegiate athletes that are active on various social media platforms. I was very pleased to see someone finally capitalize on this opportunity; PLAAY is certainly a startup to keep on your radar during 2018. Special thanks to @NYCMediaLab, Justin Hendrix and the #SMT18 panelists for such an amazing event. The future of sports tech seems very promising. I am excited to see what will happen by #SMT19. PNG Venture, powering new growth in tech.